Justin's WeatherTalk: Storm Did What I Expected, Were You Dissapointed? I got a few emails over the weekend and more at the station this morning. The theme: Why are these storms not as wet or windy as predicted? Last week I spend a lot of time discussing what this storm would do. On Friday I pointed out the winds at the beaches had exceeded 50mph already. The rain on Friday was hard to find, since we 'dry slotted', but we did get hit on Saturday. Not only did we get hit, not only did the storms contain lightning and thunder from Friday night through Saturday, but some of those downpours produced flooding. 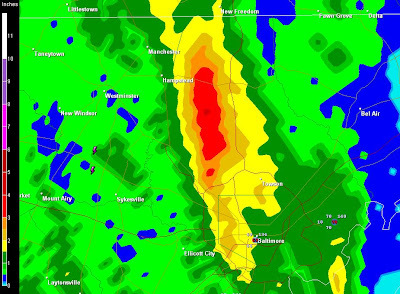 Rainfall at BWI was 3.57", but this Doppler estimate shows over 5 inches in Baltimore County that resulted in significant flooding. This map shows the area that got hit hard lines up with I-83 and Falls Rd. That was the reason for two Flood Warnings that were posted Saturday night in Hunt Valley and Shawan. That all drains into the Jones Falls.... which if you saw our coverage on ABC2- was flooding Mount Washington in north Baltimore. Below is a wider image to show show these bands set up. 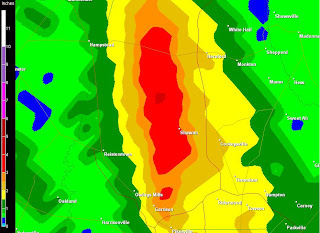 I did get a few reports from Harford and Cecil County with over 5 inches of rain as well, which was after this image was recorded.